The woven pansy style that is pictured below can be woven for you in the size and colors of your choice. Tina always has some woven flowers available for immediate sale. Please contact Tina directly to make a purchase or commission a custom-woven poppy. H 38" W 36" D 8"
Dramatic colors of different hues of purple, blue, yellow, and black reed makes this large Viola a truly elegant piece of basket art. Twisted, curling pieces of bittersweet vine create large petals woven by Tina with her own technique of multi-layer weaving called "Dimensional Weave." 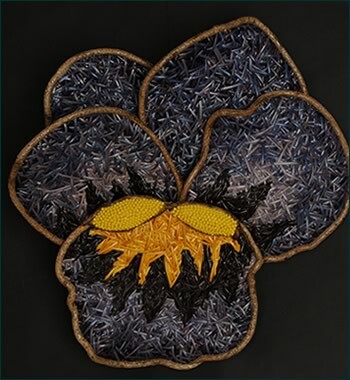 The center of this richly textured, highly dimensional large pansy wall sculpture is then accented with beaded work.